Several years after moving from Kentucky to Missouri, Boone's arthritis must have abated, for he took to poling or paddling far upriver to the tributaries of the Missouri River. His companion on these trips was sometimes his son Nathan Boone or another son, Daniel Morgan Boone. But often his only companion on such trips was Daniel Morgan Boone's slave, Derry Coburn. Derry had a family of his own, and he was an enthusiastic woodsman. He and Boone hunted together for years and became close friends. Boone and Derry went on longer and longer hunts and journeys of exploration. They paddled up the Grand River and later visited the Rocky Mountains together. Daniel Boone is known to have spent part of one winter hunting and trapping on Grand River. He reportedly went as far upstream as "the forks." This expression (the forks) can be ambiguous; it is sometimes taken to mean the actual confluence of the Thompson River and the West Fork of Grand River, just east of Utica in Livingston County. However, dating from pioneer days, the expression was used almost universally to refer to that country north and west of the confluence of the two rivers. Hunting and trapping on Grand River in the decade ending in 1810, Boone and Derry stayed in a cave and accumulated a supply of meat and furs. One morning they rose to discover a large party of Osage Indians had camped close by but hadn't spotted them. It snowed that day, hiding Boone's traps and tracks. There was nothing for Boone and Coburn to do but huddle in the cave, building only tiny fires behind cover to cook bits of meat. Finally, after twenty days, the Indians moved on and Boone and Derry were free to go outside. Boone described the ordeal later to John Mason Peck. "He stated to the writer that he had never felt so much anxiety in his life for so long a period, lest they should discover his traps and search out his camp. He was not discovered by the Indians, and when the snow melted away they departed." But on the same day a trap sprang on Boone's hand. Unable to open the trap with his other hand he had to stumble back to camp. Before Derry got the trap open, Boone's bloody hand was partly frostbitten. After injuring his hand in the beaver trap, Boone was not able to go on extended hunts for a while. He and his wife Rebecca moved to a cabin farther up Femme Osage Creek, leaving his son Daniel Morgan Boone's cabin to his rapidly growing family. SOURCE: Boone: A Biography (Robert Morgan, 2008). 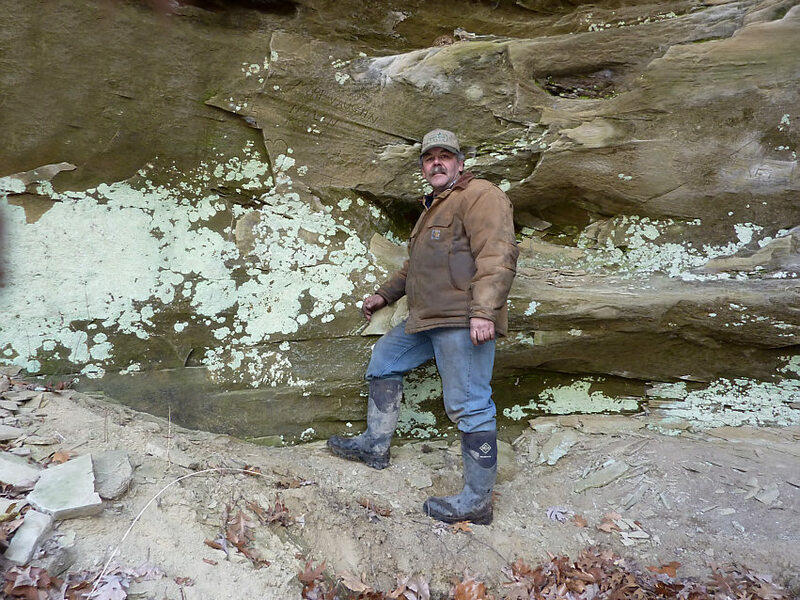 On the West Fork of Grand River, in Mooresville Township, is found a cave of sorts. A natural rock overhang -- it can hardly be called a cave -- records the visits of several local men and women who inscribed their names in the sandstone of this overhang. Most of the people identified by those inscriptions are well known to local residents as twentieth-century residents of the area. Also found there (in the past) was the clear inscription "D. Boone." Was this the authentic sign of the famous frontiersman or just another prank by some fun-loving local boys? Elston H. "Bud" Stout (1909 - 2000) told of his several visits to that cave and of seeing "D. Boone" inscribed there. He did not speculate whether the signature was authentic. SOURCE: Mooresville History (James E. Stout, 1999). These photos were taken in the cave in January 2012. Initials DB. 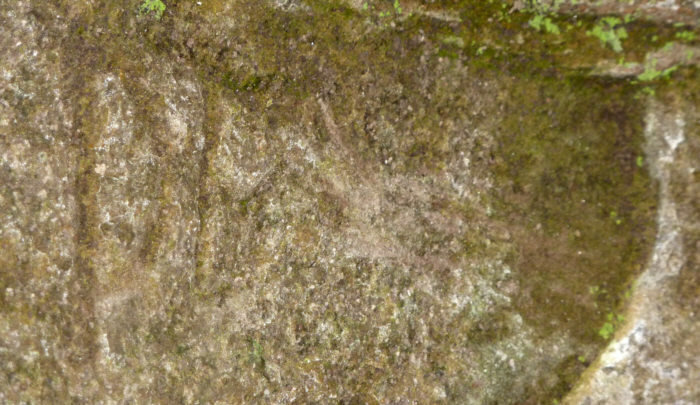 The rightmost part of the inscription has been removed by gravity or by a souvenir seeker. George F. "Rob" Roberts IV in the cave. 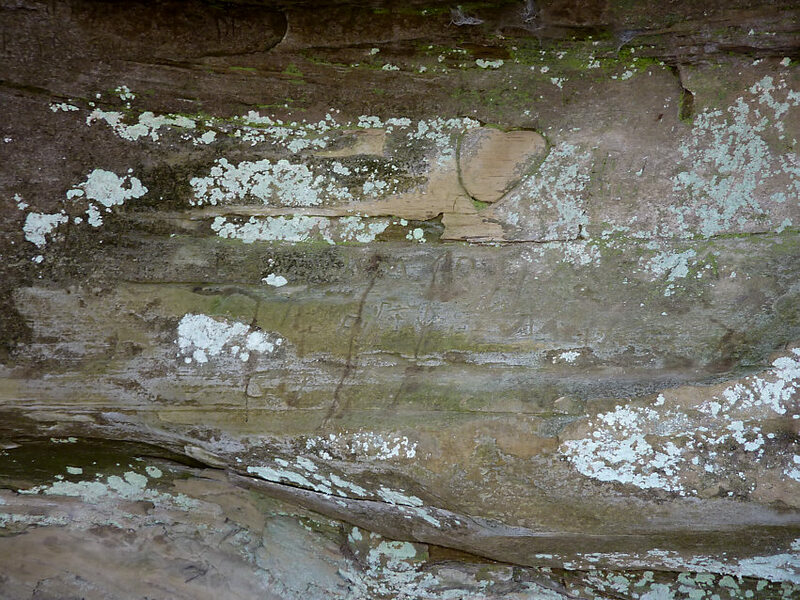 Some of the inscriptions in the soft sandstone are virtually illegible.